This demo will show you some of the most popular ways to use our Posts Table with Search & Sort plugin. This free WordPress table plugin automatically lists your posts in a searchable and sortable table. You'll find all the usage details you need on the plugin's WordPress.org listing, and here you'll find examples of the sortable, searchable post tables in action. Try them out for yourself by clicking to sort by any column, trying the pagination, or searching for a keyword. Do you need extra functionality in your WordPress table plugin, letting you use custom post types, media embeds, and advanced sorting in your table? Then have a look at our premium plugin Posts Table Pro, which also comes with our world-class support. Set wrap=false to prevent rows wrapping onto multiple lines. If selected columns no longer fit in the table, then a "+" icon will appear to the left of each row to allow access to the rest of the data. You can sort posts by clicking the sort arrow at the top of each column. You can also set a default sort order when the table is first loaded by using the `sort_by` option. You can sort by any column name: id, title, date, author, category or content. If the column does not appear in your table, it will be added as a hidden column at the end, so the ordering still works as expected. The example below sorts each post by their title. It also shows how to use the content_length option to set the number of words displayed in the content column. You can limit the posts by category using the category option. The demo below lists posts from our Posts Table Pro blog category. You can only specify one category and you must use the slug (not the name!) of the category you want to display posts from. If you don't know the slug for your category, you can find it in the WordPress admin under the Posts -> Categories menu - the slug is displayed in the category list table. The search_on_click feature lets you automatically search (i.e. filter) the table by clicking on certain links in the table. The free version is limited to post categories or author links, but the Pro version extends search on click functionality to post tags and custom taxonomies - as well as letting you add filter dropdowns above the table. Try clicking the category or author links below to filter the table. 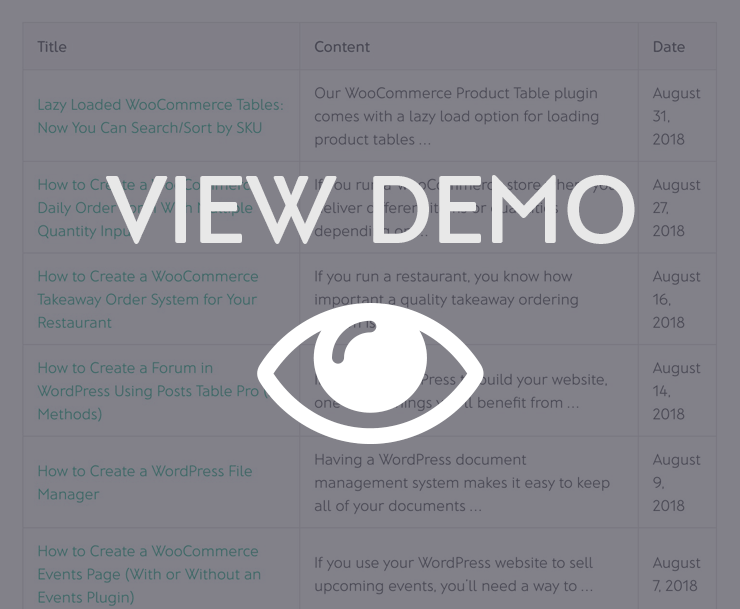 Or, if you're using WooCommerce, then check out WooCommerce Product Table, built specifically for eCommerce sites. Create more advanced tables and get extra functionality with Posts Table Pro, today!